DOES GEORGE MITCHELL HAVE THE JUICE? "All conflicts are created and sustained by human beings," says former Senate majority leader George Mitchell, who learned that while brokering peace in Northern Ireland. He's using those lessons to try to uncover baseball's secrets about steroids. Plenty of people say he's the wrong man for the job. But history says don't count him out so easily. The satellite truck sits on the lawn like something that's landed there. You wind your way through the forests of Acadia National Park, running inland from the eastern coastal part of Maine's midsection. The hills get dark all at once around you. There's a side road and then a smaller one, and then you come to the Asticou Inn, which is beginning to close for the night. The laughter and music from the wedding down the hill is beginning to fade. The lights wink out on the boats moored in the tiny harbor. And there, on the lawn, under a huge, patriarchal tree, is the truck, staking out its space with floodlights, its dish aimed toward the crowded, starlit sky. The Asticou is a quiet, dignified place that caters to people who want to experience the forest without actually living in it. On the first floor, just off the lobby, there's a small room that is called the library but is really more of a lounge. The door is open just wide enough so that you can see television lights. The 24-hour news cycle has come to call. Israel is bombing southern Lebanon. Larry King wants to talk about it, so the truck parks on the lawn of the Asticou Inn. George Mitchell walks up the hill and into the little library. The lights of a wider world frame him as he walks through the door. "Nice to meet you," he says to someone who's come up to the inn to talk to him about something else entirely. "Looking forward to chatting." MESSAGE BOARD: Can George Mitchell make a difference in baseball with his steroid investigation? He is 73 years old now, 11 years removed from the height of his power as the last true Democratic majority leader of the United States Senate. The Maine politician had been extraordinarily effective during his swift rise to that post, bedeviling two Republican presidents, Ronald Reagan and George H.W. Bush. On President Clinton's behalf, Mitchell helped shepherd NAFTA through the Senate. But he found himself burning out. His first marriage reportedly fell apart under the strain, and Mitchell left the Senate in 1995. Since then, Mitchell has built a career in the field of Gravitas for Hire. He became a high-priced lobbyist, pitching the interests of (among others) candy makers and big tobacco. He went to Northern Ireland at the behest of Bill Clinton and, through dogged, iron-pantsed persistence, helped forge what has become known as the Good Friday Agreement between the warring parties there. In 2000, he led an international fact-finding mission on Middle East violence and later submitted a blueprint for peace. He accepted the chairmanship of a commission investigating the hopeless welter of corruption surrounding the 2002 Olympic Winter Games in Salt Lake City. Tonight, he has come up to the Asticou Inn from his vacation home nearby and, through the dish on the lawn, to Larry King - to explain gravely the latest spasm of violence in the Middle East. Have gravitas, will travel. He has another job now, though, one that takes place in another different world. On March 30, Mitchell became the lead investigator for Major League Baseball into the seemingly endless revelations surrounding the use of performance-enhancing drugs by its players. In this, he has no firm deadline. His mandate is both broad and vague, and his investigators have only begun to fan out throughout baseball, politely asking questions and unburdened by such impolite devices as subpoenas. The scandal now has metastasized in so many directions that it long ago abandoned any kind of coherent narrative line. On that very morning, for example, the out-of-town newspapers in the lobby of the inn carried the stories of both Floyd Landis and Justin Gatlin, a cyclist and a sprinter respectively, whose triumphs are being removed from the record books because they'd both tested positive for banned substances. The whole thing first exploded with the 2003 bust of the BALCO laboratory in California, a nutrition company that counted a number of elite athletes among its clients. It now had come to involve criminal trials, the jailing of reporters, noisy congressional hearings, a line in a State of the Union address, and a kind of free-floating existential angst over the definition of authenticity in athletic achievement. Nowhere is this angst more acute than in baseball, which always has been thickly wrapped in its own history. After baseball immolated itself over labor issues in 1994, it was power-hitting that had revived it. Now that resurrection seems in no small part to have been a pharmaceutical one. The emotional response to the scandal resonates more deeply in baseball - as opposed to, say, track or cycling - because of the sport's nearly bottomless well of self-importance. "Baseball," Mitchell says, "has a unique hold on the American people." In one sense, Mitchell's selection made every kind of sense. He was a former prosecutor and a former federal judge. He had experience - most notably in the Iran-contra affair - in delving into the minutiae of heated and complicated public issues. From his days in the Senate, but, most especially, during the months it took to wring the emotional poison of centuries out of the negotiations in Northern Ireland, Mitchell evinced a great gift for creating an unlikely consensus that can lead to workable solutions. Which, if you listen to his most prominent detractors, is precisely what his new job is set up not to do. He has demonstrated in the past a gift for establishing a language through which compromise can be developed and solutions found. "He's dealing with a situation where you have a lot of conflicting interests involved," says Kelly Currie, an assistant US attorney in Brooklyn who worked with Mitchell in Northern Ireland. "You have the interests of the game in terms of owners having a revenue stream. The players have an interest in protecting their livelihoods. There's a lot at stake for everyone. One of the things that Senator Mitchell brings to the table is that he's dealt with issues and scenarios where that kind of thing is in play." Nobody is sure what Mitchell is supposed to accomplish in this new job, and nobody is sure that he's supposed to accomplish anything at all. George Mitchell has now undertaken a job in which he appears to be that most helpless of people - a politician without a constituency. A week after he was appointed, agents for players linked to the scandals scrambled to announce that their clients had no interest in cooperating with the new investigation. No less a figure than Joe Torre, manager of the New York Yankees, told the Hartford Courant that he thought someone "without a connection to baseball" should have been given the job, criticizing the choice of Mitchell, who was on the board of the Boston Red Sox (of which The New York Times Co., owner of the Globe, has a minority share) and chairman of the Walt Disney Co., which, through its ownership of ESPN, is in business with Major League Baseball. Consequently, Mitchell took the job knowing full well that a powerful array of interested parties judged him from the start as, at best, the hired hand of a baseball establishment that didn't want to know the truth about itself or, at worst, a willing bobo with interests hopelessly in conflict. Everyone in baseball is resolutely tightlipped about the specifics of the investigation. Mitchell talks about it only in the broadest terms. Baseball commissioner Bud Selig declined to be interviewed for this story, as did the owners of the Red Sox. The more rigid of the antidrug warriors likely will remain unmoved no matter how scathing his eventual report is. After all, as a result of the fallout from the BALCO case, Major League Baseball did develop a stricter drug-testing program, but that program has been criticized for not going far enough. The criminal prosecutions will grind on elsewhere, dwarfing Mitchell's probe in significance and making it increasingly unlikely that any of the scandal's most high-profile figures will even cooperate with him. Mitchell's investigation seems to have a problem with its identity. He will do his work in a wilderness of skeptics. "From my standpoint, it's a very odd thing he's doing in the first place," says Richard Pound, the chairman of the World Anti-Doping Agency and a former vice president of the International Olympic Committee. "Maybe he's smarter than we all think he is." He is smaller than you'd think, and just a bit stooped. His voice is soft and measured. 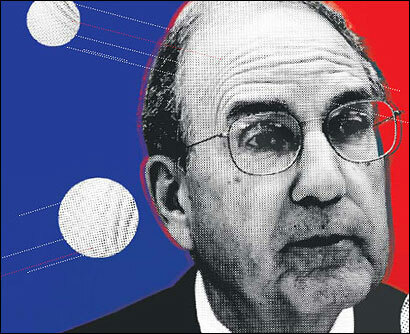 But there is about George Mitchell a nearly palpable shrewdness, a sense that he is at least a half step ahead of where you think he is, and at least two steps ahead of where you are. He is the nice, kindly old gent who wanders up to the $500 poker table and leaves, two hours later, with everybody else's money. Anybody who thinks that George Mitchell is an innocent is asking to hitchhike home with an empty wallet. "As a result of my experience in Northern Ireland," Mitchell says the next morning, with sunlight sparkling off the little harbor below, "I developed the conviction that there's no such thing as a conflict that can't be ended. The same thing is true of this dispute. All conflicts are created and sustained by human beings. There are motives and interests involved. If you can identify and accommodate the motives and interests, you can resolve the dispute." His answer is cautious, sure-footed, the way you have to walk if you walk between so many different worlds. In Waterville, north of Augusta and dead in the heart of Maine, the Mitchell boys were the town superstars. Especially John, whom they called "Swisher," who played basketball well enough to go to the University of Rhode Island to play and engage in duels with a skinny Holy Cross point guard named Bob Cousy. George was the small, slow one of the four Mitchell boys. A family friend helped him gain admission and get a work-study job at Bowdoin College in Brunswick, Maine. From there, he went on to Georgetown, going to law school at night while settling insurance claims during the day to pay his tuition. He then rose from lawyer to US attorney to federal judge, until he wound up as the Senate majority leader. At the time Mitchell announced he was leaving the Senate, Selig was still officially the "interim" commissioner of baseball, and Mitchell, his love for baseball well known in and out of Washington, spent a great deal of time politely fending off questions about whether or not he wanted the job. "A couple of owners asked me if I'd be interested in the possibility of becoming commissioner," he recalls. "My answer to them was the same as my answer to everyone - that, considering the number of calls I was getting, I'll consider anything, but I don't ever think it was a realistic prospect." Instead, President Clinton asked him to go to Northern Ireland. While he was there, Selig was made the permanent commissioner, which Mitchell suspected was the plan all along. Meanwhile, Mitchell was learning a deep lesson in reconciling the apparently irreconcilable, finding a constituency for peace where none had existed before. "He's very adept at listening to people expound on what their motivations are and what they want at the end of the day, finding and looking for common threads and being able to look for areas of compromise," Currie says. "The other great skill he has is having the sense of when is the right time to push for an agreement." It was these negotiations that created Mitchell's image as a troubleshooter of the intractable. It turned out that sports was a uniquely target-rich environment for someone like that. In 1999, along with former Federal Reserve chairman Paul Volcker and columnist George Will, Mitchell served on the Blue-Ribbon Panel on Baseball Economics. They were appointed by Selig to study Major League Baseball's financial structure. (The panel's report eventually resulted in changes in the way baseball did business, including adding a new luxury tax, purportedly aimed at making it easier for small-market teams like Minnesota or Tampa Bay to compete for high-priced talent with teams in New York, Boston, and Los Angeles.) Earlier, on behalf of the US Olympic Committee, Mitchell took a job as the chairman of an investigation into the bid-rigging and associated brigandage involved in bringing the Olympic Winter Games to Salt Lake City. Ironically, Mitchell was joined on this committee by Donald Fehr, the combative head of the Major League Baseball Players Association. Fehr watched as Mitchell moved deftly amid the competing interests, many of which were not overly enamored of the idea of any investigation. He watched Mitchell grow a constituency, and then a consensus. "You could see him figure out a way to meld the group," Fehr recalls. "In something like that, the closer you can get to unanimity, the better off you are. While it was pretty clear early on that we had a consensus on the broadest possible level, that's different from the consensus you need when you're making recommendations. "He was deliberate, and he wanted to make sure we all understood the nature of the challenge ahead of us, what kind of recommendations we could make that were likely to be accepted. You can do all the reports in the world, but if people don't pay attention, it doesn't matter." The USOC commission almost perfectly presaged the job that Mitchell now has undertaken on behalf of Major League Baseball. At its start, the venture was lampooned as an in-house investigation. There were ongoing criminal investigations with their own imperatives that necessarily limited what Mitchell's commission could do. "Halfway through our inquiry, two principals were indicted in Salt Lake City," Mitchell recalls. "So we had to contend with that reality, just as we do now with the BALCO [criminal] case." Nevertheless, Mitchell's investigation produced a series of concrete recommendations, all of which the USOC adopted, and some of which were adopted by the International Olympic Committee, even though the IOC had treated Mitchell's probe with a disdain that could properly be called, well, Olympian. By far, Mitchell's report reserved its most scathing criticisms for the way the IOC did business, citing an inbred and deeply thoroughgoing culture of corruption. It is a measure of how deeply Mitchell is wired in so many different directions that, when an influential Utahan named Mitt Romney stepped in to help implement the commission's recommendations, Mitchell already knew him, having served with the future governor of Massachusetts on the board of directors of the Staples corporation. Through all of this, baseball continued to have a unique purchase on Mitchell's affections. When he was still in the Senate, he'd given a speech in Palm Beach, Florida. Afterward, he'd fallen into conversation with a local hedge-fund millionaire named John Henry. The two kept in touch. When Henry bought the Florida Marlins in 1999, Mitchell joined the team's board of directors. Over the next three years, Mitchell was enmeshed in the machinations through which a group that included Henry obtained the Red Sox. "My involvement began when Les Otten, who's from Maine, asked me to be part of a group that he was putting together to try and buy the Red Sox," Mitchell explains. "I went to a few meetings, and he was talking about a public offering to finance the purchase. I told him that I thought that was unlikely to be baseball's first choice and that it might be better to find partners." Otten then brought in Tom Werner, and Werner brought in Larry Lucchino, through whom Henry came aboard. "Tom contacted me, and I had been out of it for a long time by then," Mitchell says, "and he asked me if I'd consider rejoining the group because of my knowledge of the economics of baseball, and because I knew all the owners because of my membership on the blue-ribbon panel. I became part of that, but I'm not an owner. I have no ownership stake. I'm on the board, and I'm called a director." He has been somewhere in baseball throughout all the connected traumas of the past decade. He was there when the sport nearly committed suicide over economics in the early 1990s, when people were wondering if the game might be lost forever. And he was there when it came back, gloriously, at the end of the decade, because, suddenly, Mark McGwire and Sammy Sosa and a lot of other people were hitting home runs and everyone was cheering. THE YANKEES COME INTO FENWAY PARK ON a glorious evening in the late summer to begin the process of dismantling the Red Sox. New York manager Joe Torre, as clearly a baseball lifer as ever was, shifts uncomfortably in his chair. Mitchell's investigators have been in to talk to Torre, his coaches, and his players. "I'm really not at liberty to talk about it," says Torre, and that's a measure of where baseball is on the issue of steroids. It's in a place where Joe Torre talks like John Ehrlichman. "This was the generation of players that was involved, and, fairly or unfairly, this is the generation of players that will have to find a solution," Torre says. "You know, I'm a truster by nature. To me, if you say to me, 'Trust me,' generally, I'll do it." On nights like this, the vast steroid controversy - and Mitchell's investigation - seems eerily distant from the game it has so deeply affected. The comical performance of current and former players before a 2005 congressional committee, in which McGwire put up a stone wall worthy of a Watergate burglar and Rafael Palmeiro swore on everything except the heads of his grandchildren that he'd never taken any of the proscribed potions - a denial ultimately rendered, in Watergate lexicon, "inoperative" - seems now to have taken place somewhere around the time of the Missouri Compromise. Out in San Francisco, the BALCO case and the pursuit of Barry Bonds have morphed into a perjury investigation in which two San Francisco reporters might end up in jail on contempt citations. As early as 1988, a respected sportswriter was calling athletes who used the banned substances "bloodstream terrorists." More recently, their use, and the continual science-marches-on development of new and harder-to-detect drugs, have amped up the complex issues involved into the kind of existential apocalyptics not unfamiliar to people who have lived through precious antidrug frenzies. But, beyond the perfervid rhetoric from the sports punditocracy, inside the ballpark, the various probes, prosecutions, and investigations feel as though they're taking place on different worlds entirely. Outside the park, Mitchell's work seems lacking in outrage. Inside the park, it seems to be just another annoyance of the long season, like day games after night games, or soreness in your rotator cuff. His staff has interviewed club officials on several of the teams, including the Yankees and Red Sox. But several of the scandal's most prominent names have declared themselves, or have been declared, out of bounds. McGwire has declined to participate, as has Bonds, unless Bonds is assured his testimony won't be handed to federal prosecutors. Mitchell has no power to compel them to cooperate, and, he says, he's content with the narrow parameters of his mandate. "It might be better if [the BALCO prosecution] didn't exist, and I had other powers that I don't have," he says. "I have to go through several narrow needles, and there are clearly constraints to what I can and cannot do." The antidrug advocates have criticized Mitchell for accepting a mandate from a commissioner whose sincerity they very much doubt, and for maintaining his position as a director of the Red Sox. (Mitchell has retired as chairman of the Disney Co.) They have fumed at what they perceive as the limitations he has so readily accepted. "This needs to be done by an independent organization, with transparency," says Dr. Gary Wadler, an author and an expert on doping in sports. "This can't be done in-house. Is this the right venue for George Mitchell? I'm not sure it is." In fact, Mitchell's task is complicated not merely by the limitations of his mandate but by other considerations as well. The preferred solution to the problem is an increase in the frequency and the thoroughness of mandatory drug-testing. Because there are serious privacy concerns involved in this, concerns that are no less real for how regularly they are derided, it will require an unprecedented level of cooperation between labor and management - sides which have spent more than 30 years distrusting each other. And all of it will be conducted with a spiraling chorus of high-decibel commentary wailing away in the background. It is almost impossible to imagine the kind of report that Mitchell could produce that would satisfy everyone. So much of his own investigation is so far out of his hands. "I don't think it's realistic to expect people to calm down," Mitchell says. "This issue transcends baseball. There's the story about the sprinter. Last week was dominated by the story of the Tour de France. These things reinforce public interest. It might be nice if everybody calmed down, but I'm prepared for them not to." So, more than anything else, Mitchell's job seems to be to develop a language within which baseball can agree to talk to itself about the problem. So much of the scandal seems to be speaking in tongues - in the iron syntax of the law, say, or the flammable, if largely useless, vocabulary of moral outrage. What Mitchell learned elsewhere, particularly in Belfast, is that the creation of a common language is the first step toward reaching a consensus on what will be said. What may be left to him is to create, as best he can, the official history of the steroid era in baseball. It would be kind of common narrative, the lurid details of which probably will be filled in from other venues, and other investigations, the dramatis personae identified and anathemized by people who are not George Mitchell. In that, then, removed from the cacophony of charges and countercharges, a step away from the emotional innuendo and the rhetoric of doom-laden moralism, he may find what he's always found, in senatorial wrangling, and in the deep murk of ancient sectarian hatred, and in the back rooms where was practiced Olympian greed: a common ground, from which everything can move forward a little. He will find a constituency of his own devising. 1933 George John Mitchell is born in Waterville, Maine. 1954 Receives bachelor of arts degree from Bowdoin College. 1960 Receives degree from Georgetown University law school. 1962 Joins staff of US Senator Edmund Muskie (D-Maine). 1965 Returns to Maine and works at a private law firm. 1979 Named US district judge for Maine. 1980 Appointed to complete Senate term of Muskie, who was appointed US secretary of state. 1982 Elected to US Senate. 1987 Co-chairs congressional inquiry into Iran-contra scandal. 1989 Elected majority leader of Senate. 1995 Retires from the Senate. 1995 Begins mediating between warring factions in Northern Ireland. 2002 Leads commission investigating corruption involving 2002 Winter Olympics. 1930s and 1940s Anabolic steroids are developed, primarily to treat hypogonadism, a condition marked by a deficiency of testosterone. Researchers later discover that steroids facilitate muscle growth in laboratory animals. 1950s and 1960s Pharmaceutical company Ciba develops the steroid Dianabol, and its popularity grows among athletes. 1975 The International Olympic Committee bans steroid use. 1987 The NFL begins a steroids-testing policy. 1988 Olympic sprinter Ben Johnson is stripped of his gold medal after testing positive for steroids. 1990 Congress makes it a felony to possess steroids without a prescription. 2002 Former major leaguer Ken Caminiti tells Sports Illustrated he used steroids and estimates half of all players are using performance- enhancing drugs. 2003 The Centers for Disease Control says 6 percent of high schoolers have used steroids, more than double the figure from 1991. 2003 Federal agents raid the facilities of supplement maker BALCO. Charles P. Pierce is a staff writer for the Globe Magazine. E-mail him at pierce@globe.com. MESSAGE BOARD: Can George Mitchell make a difference with his steroids probe?